Yasunao Tone (b. 1935) is a Japanese-American artist, writer, theorist, and composer. 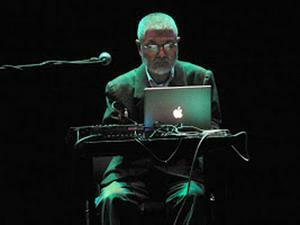 He co-founded Group Ongaku (Music group) in the early 1960s, has been active in the Fluxus movement since 1962, and has also been an organizer and participant in many important music and performance scenes including New York’s Downtown improvisors, and the European electronica experimentalists. Tone has worked in many media, creating pieces for electronics, computer systems, film, radio and television, as well as environmental art. His work is distinguished by conversion of text into music via images with analog and digital means, and with critique of medium in use ( Music for 2CD Players , Solo for Wounded CD). Tone has presented at the Kitchen, MoMA, the Guggenheim, the Whitney, the Venice Biennale, MoCA Barcelona, Ars Electronica, Centre Pompidou, and Lovebytes festivals, among many others. Honors include the Ars Electronica Golden Nica award and the Foundation for Contemporary Arts award in music.